Legacies are the weak point of organisations today because they’re ripe for disruption internally and externally, Wunderman Bienalto CEO, Hurol Inan, claims. 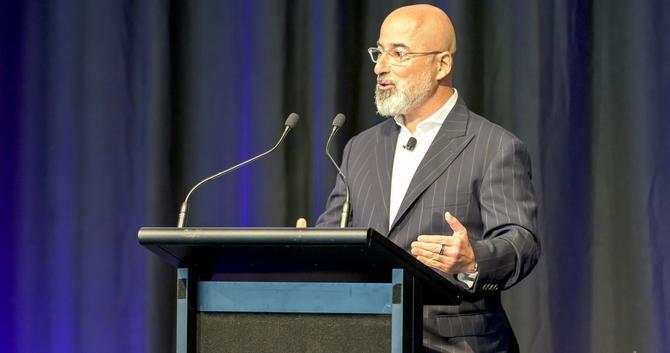 Speaking at today’s Marketo Executive breakfast event in Sydney, Inan said organisations looking to cope with the amount of change being experienced in the shift to industry 4.0, and blurring of the line between the digital and physical worlds, must embrace holistic, disruptive change. For example, in the insurance sector, the traditional business model penalises existing customers, Inan said. Every time a consumer gets their next annual insurance premium, the price has often gone up, an issue that needs to be tackled if these organisations want to become more customer-centric. Inan offered up five key pieces of advice on how marketers could better embrace change in the face of industry 4.0. The first was to “open up”. “We’re dealing with significant complexity and uncertainty, and the opportunity we unlock is messy,” he said. “Move away from controls and closed organisations to more collaborative organisations. Two extremes of management style are control and delegation. Delegation is as bad as control. The complexity is so large, and the opportunity so messy, that we cannot simply delegate transformation to a single, small and not so senior business unit. Along this line, Inan encouraged leaders to foster diversity. “If we hang around people like ourselves, we won’t change,” he commented. “But it’s hard to challenge the status quo. Agility, while not new, was Inan’s third pillar of change, and the way forward if organisations want to deliver best quality products that continuously evolve. As a final piece of advice, Inan said organisations should work to short-term planning horizons, because uncertainty means organisations have limited visibility. “Gone are the days for planning 3-5 years, the more realistic planning horizons are 6-18 months,” he said.